One of the key images in Skyfall, the twenty-third James Bond film and the third to star Daniel Craig as the super-spy, is of Bond standing on a London rooftop. As he gazes out over the city, he is framed alongside such indelible symbols of Britishness as The Houses of Parliament and the Union Jack. It's a quiet and contemplative moment, particularly in comparison to the percussive, rollicking juggernaut that surrounds it, but it's one that underscores one of the underlying ideas behind the film. Seeing as its release coincides with the fiftieth anniversary of the series, Skyfall has to pay due diligence as a celebration of the legacy of EON and Cubby Broccoli, who helped to make James Bond as much an icon of British culture as the aforementioned building and flag. At the same time, it has to tell its own story and advance the series; celebrating what has gone without getting stuck in the past, moving forward without jettisoning it. The Houses of Parliament look much the same as they did in 1962, but the landscape around them has changed dramatically, and the same is true of James Bond. The series has been striving for relevance in a post-Cold War world ever since M (Judi Dench) referred to Bond as a "sexist, misogynist dinosaur" and a "relic" in Goldeneye, but that amounted to little more than an acknowledgement that things had changed whilst the series continued on with business as usual. Meanwhile, the relapse into Roger Moore-esque campish buffoonery with Die Another Day forced a drastic re-evaluation of how Bond fit into a post-Jason Bourne world, one in which invisble cars look just a little bit silly. Martin Campbell's glamorously brutal Casino Royale did much to redress the balance, turning Bond into a brute who seemed both antiquated yet appropriate for the age. The decision to hand directing duties over to Marc Foster, one of the most consistent journeyman purveyors of middlebrow awards bait, proved to be an egregious error, since he turned Craig's second go round in the tuxedo into a cacophonous mess with a title as obtuse as its plot. The (entirely appropriate and justifiably) harsh reaction to Quantum of Solace, combined with the bankruptcy of MGM, which threw Skyfall's production into disarray and delayed it by more than a year, made it seem as if Bond's attempt to move into the twenty-first century might have been rather badly, if not mortally, wounded. In short, Skyfall had a lot to live up to. Not only did it have to surpass its immediate predecessor - which, admittedly, isn't the highest bar to clear - but it would also have to deliver on the promise of Casino Royale, and serve as a suitable celebration of Bond's semicentennial. What should have been just another instalment in a venerable series suddenly seemed laden with import, and woe be unto the person who has to shoulder the burden. Considering all the baggage Skyfall comes weighed down with, one of the many pleasant surprises of the film is how sprightly it all feels, even as it runs well over two hours. From the opening scene, which finds Bond chasing someone who has stolen a valuable hard-drive through the streets of Turkey, director Sam Mendes and editor Stuart Baird keep the film move at a truly relentless pace. Yet even as the film barrels forward with the momentum of a runaway train, it never leaves the audience behind or misses an opportunity for playfulness, either in the dialogue or in the style. For example, the opening ten minutes of the film find Bond, aided by the ever delightful Naomie Harris, careering around in a car, driving a motorcycle over rooftops, then having a fistfight on top of a train, in a string of incidents which are seamlessly orchestrated and never lapse into visual incomprehensibility. At the same time, it finds room for plenty of badinage between Craig and Harris, and even starts with a witty riff on the Bond series' traditional "gunsight" intro. It's a sequence that has to keep a lot of balls in the air, but it almost effortlessly keeps them aloft, and occasionally throws a few extra ones up there to show off. It's an exciting beginning that sets the tone beautifully. From there Skyfall settles into the agreeably laid back vibe of most Bond films, as Bond goes in search of the stolen hard-drive, which contains the identities of hundreds of secret agents around the world, globetrotting between dazzling locations in the process. At the same time, M finds herself at odds with Gareth Mallory (Ralph Fiennes), a government official who has been tasked with essentially forcing her into retirement for losing the hard-drive in the first place. 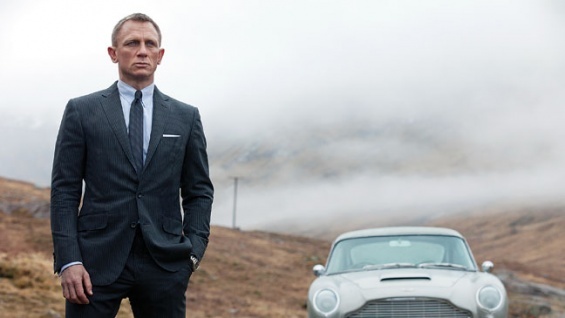 Ageing is a recurring theme throughout Skyfall, as both Bond and M are directly faced with the possibility that they are now too old or too set in their ways to tackle the problems of the modern world. In essence, the film echoes M's sentiments from Goldeneye but, rather than treating them as a sly wink to the audience, Mendes and the screenwriters (John Logan, Neal Purvis and Robert Wade) treat them seriously, and place them at the heart of the story. As in Casino Royale, Bond is a something of a super-hero but he is also a man, one who bleeds, gets tired and faces the real prospect of being unable to keep up with the times. It's not hard to see parallels between Bond's predicament and that of the series itself; just as Bond has to contend with his old, battered body, the series has to pick up the pieces after Quantum of Solace and try to reinvigorate itself, something which character and film manage with aplomb. It helps that both have a powerful obstacles to overcome, making their successes feel earned; whilst Skyfall has to wrestle with the wreckage of its predecessor, Bond has to contend with Raoul Silva, a bleach-blond former MI6 operative turned cyberterrorist played with gleeful malice by Javier Bardem. Silva holds a grudge against M, who he blames, rightly or wrongly, for various physical and mental injuries inflicted upon him, and the central dynamic of the film is between M, Silva and Bond. The two men are presented as favoured sons of their mother figure, both of whom were in some way abandoned, but whilst one remains staunchly dedicated to a cause and country, the other has become dedicated to his own cause: revenge. Yet both share a fierce intelligence, ruthless efficiency, and a vaguely sadistic streak, so even though they are diametrically opposed in some ways, they meet in the middle elsewhere. It's a very simple dichotomy not unlike that of Batman and The Joker in The Dark Knight, but it adds an agreeable wrinkle to the typical Bond blueprint. Speaking of a blueprint, Skyfall also brings in some of the elements of the Bond mythos that were deliberately left out of Casino Royale, though it does so in a way which is in keeping with the slightly more down-to-earth vibe of the Craig era. The key one, in this regard, is the new Q, played by Ben Whishaw. Again, the casting plays into the idea of ageing by contrasting Bond's craggy seniority with Q's 'precocious sixth-former' take on the old Quartermaster. Rather than handing out exploding pens (as Q points out, they don't really go in for that anymore, which is probably the best moment of self-aware humour the series has seen since George Lazenby complained about how much easier "the other guy" had it in On Her Majesty's Secret Service) he gives him a gun and a radio, and mainly helps by working against the advancing hacking techniques of Silva. Whishaw gets plenty of big laughs and has great chemistry with Craig, presenting a take on the Bond-Q relationship which is both a refreshing take on the old one and a reassuring reminder of the sort of spark that existed between Sean Connery and Desmond Llewellyn. That's the appeal of Skyfall in a nutshell, really. It combines the best of classic Bond - exotic locations, beautiful women, thrilling action - with the best of the modern - a real physicality, state-of-the-art special effects, and a willingness to embrace the fact that cinema and the world have changed. Skyfall ends having put together the pieces of its Bond from old and new parts, creating something which is exhilarating and familiar, which honours the past without getting weighed down by it. It's a film that takes big risks with the formula - not least of which is opting to narrow its focus for the finale, rather than going big and ostentatious, delivering something closer to Rio Bravo than You Only Live Twice - but also recognises what works as well. It's a Bond film, but not as we know it. It's also a hell of a lot of fun.